He has been bred for generations and selected by nature, in conformity to his surroundings. He may roam the plains, deserts or mountains, but in doing so still choose his own terrain. The burden he carries is not on his back, but in his spirit, as he strives to maintain his place in the web of life. He will seek the lush grasses of spring and summer that aid reproduction and growth, and forage sparingly and shrewdly at other times. He will spend the winter surviving on stored fat, horse sense and luck. A barrage of chemicals does not enter his body to interrupt its internal functions. He more than likely possesses a thick hide and coarse hair shaft and his stature is often little above that of the largest pony. He travels for miles in search of food and water, rarely standing in his own excrement or urine. He often bears the heat and flies of summer and the harsh realities of winter, as they are a constant in his life. He bands with respected herd mates to protect himself from predators and the elements of nature. He jumps logs, ditches and other obstacles as is necessary for survival and frolic, yet generally chooses the path of least resistance. Most unfamiliar creatures and events are deemed as foes or life threatening, until experienced in a safe, well-known zone of comfort. Is this natural horse your horse? We are bombarded these days with neo-classical ideas of equine training and horse husbandry. We are told that the natural horse is best. We have been told that it has taken evolution millions of years to produce the natural horse described above and we should not interfere with nature or we will suffer the consequences. Why then have so many horses "adapted" reasonably well, in a comparatively short time to shoes, shows, stalls (straight and box), saddles, bridles, bits, wagons, trailering, neutering, changes in eating/sleeping patterns, medicines, and yes, humans with all their foibles and desires. How many of the natural conditions can you discard and still have a natural horse? That is probably a personal conclusion you will choose based on your comfort level as you justify the ownership of your horse. Clinicians and others who want to sell us on "natural" shoes (and boots and sneakers), "natural" bridles, halters and saddles (making a profit in the process, yet all for the good of the horse), need to present us with the whole truth and allow us to make our own decisions. Except, like the quote from the motion picture, many of us "can't handle the truth". Human babies are born naked (naturally), yet we clothe them. Any holes or body functions that are not normal are deemed defects and modern medicine quickly employed. Yet our offspring defeat us repeatedly by insisting on putting holes somewhere and colouring their skin with dies and ultra violet rays. Do we consider these practices unnatural? (some, of course, will say "yes") Yet where do we draw the line? Do we all move to countries and climates that allow for unlimited nakedness and body piercing to satisfy the desires of some? I know of those who would die in the process of adapting. It is quite evident to most non-horse people (and indeed to many experienced horse people) that horses naturally bite, kick, and attempt reproduction at times most inconvenient to humans. 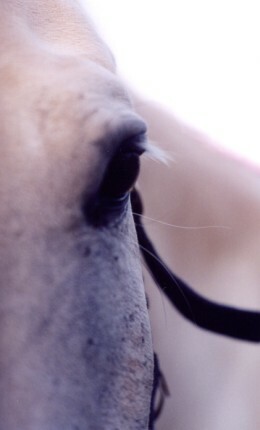 Should we interfere with this naturalness and whisper to our horses that there is a better way? A number of people extol natural methods, but tend to pick and choose which ones suit their particular personalities and attributes, not their horse's. Some, who say our horse needs to go barefoot, may also persuade us into vaccinating for every sniffle and cough. We should be protecting our horses as much as possible. We are jumping, reining, team penning, and flying in airplanes to Olympic events. Horses are living in large groups in smaller areas. They are being bred for specific purposes and may lose traits that were a natural barrier to harm and disease. They should not just be taking their chances with the situations they are now presented with as part of our human world. As responsible owners and human beings, it is a given that we regard the life of our animals. We need to be offered unadulterated advice, supplied by people who have very little to gain personally (whether monetary or otherwise). We should not have untested drugs or isolated practices pushed onto us by people who are being paid to do so or who would lose their livelihood if they did not push. People who sway the horse world without submitting rational alternatives to their own, however ideological and pristine they may appear, can be very unsafe. To avoid both the pitfall of over or under simplifying our horse's life, we need to moderate all our equine experiments with sound advice, reason and intelligence. Our horses MAY need a break from the continuous intervention of man - but then, most horses today are only alive because of such intervention. The wise horse owner is one who gets as many facts as possible and chooses not to be shamed or lured into practices that may be harmful and not befitting to his own individual horse's heritage and lifestyle.